Pedro Berruguete, Saint Dominic Presides over an Auto da Fe (c. 1495) (Portuguese for "Act of Faith"). The Inquisition was the legal agent of the Catholic Church against heresy in the Middle Ages. It did two main things. First, it issued a list (the Index) of published books banned because they contained heresy. The faithful were forbidden to read such books. Second, it prosecuted individuals thought guilty of heresy. Later versions of the Inquisitions had the power to use torture or the threat of torture to get confessions and religious conversions. It had the power to order executions. The standard method was to burn heretics alive, or to garrotte them in public. The actual deed was done by the civil authorities. 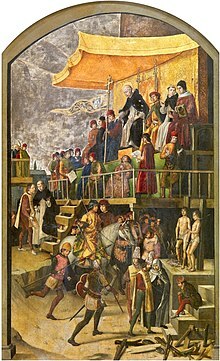 The full name of the Inquisition was the Sacred Congregation for the Propagation of the Faith (Latin: Sacra Congregatio de Propaganda Fide) of the Catholic Church. It developed in stages. The first permanent Inquisition was established in 1229. It was run by the Dominicans in Rome. In 1478 Ferdinand II of Aragon and Queen Isabella I of Castile set up the Spanish Inquisition. In 1542 Pope Paul III established the Congregation of the Holy Office of the Inquisition as a tribunal staffed with cardinals and other officials. This version supervised the local Inquisitions in other countries, and also investigated important cases from Italy. The most famous case it tried was that of Galileo Galilei in 1633. The word Inquisition comes from Latin quaerere. That means to to turn, to ask a question. This page was last changed on 26 March 2019, at 08:22.